Hanging out inside your human's pocket is a fun way to enjoy your human. However, it can be tricky to help a rat figure out how to fit inside a t-shirt pocket. At the bottom are several videos of pet rats in t-shirt pockets. 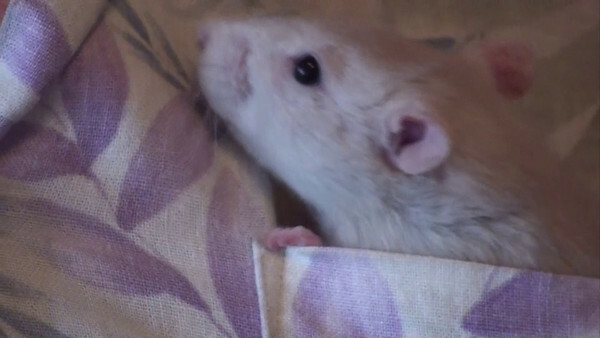 Rats can figure out t-shirt pockets. It's not easy though, t-shirt pockets are rather small. The rat needs to pretend to be a snake (gasp) and do a "u-ee". Once in, they feel pretty safe, and you can practice scritching and snuggling. The standard recipe is one t-shirt with pocket and add one rat. My rats are female, though, and I'm doubtful that a male rat can fit in a t-shirt pocket. Surely there are other larger pockets out there, though. The triumphant day came. Bonny slid into the pocket upside down and stood on her head for a while. Then, she started to poke and shove and yank and twist. Slowly she began an agonizing u-turn like a snake, pulling her bottom down inside while her head and shoulders began to travel upward, always keeping part of her body into the very bottom. I confess my jaw dropped and my eyes slightly bulged. The thought crossed my mind that she might even hurt herself. When Bonny was done her whole rear end was stuffed into the bottom of the tight pocket. When she first popped her head out the top, she was clearly in heaven. She promptly closed her eyes and bruxed loudly. I cannot tell you how much I praised and kissed that rat. She did not come out for a very long time and I didn't make her either. Then came the day when I had all four rats on my shoulder. I knew this would be interesting. Sure enough, Bonny dove head first straight off the top of my shoulder down into the pocket, a dive of 10 inches, and once inside the pocket, she did a neat and fast u-eey. Chancy, Lila, and Melody *froze* and stared, and their eyes bulged out, sparkling with jealousy. After a moment they made for Bonny and froze right over her, staring. Bonny had her eyes half closed in delight and paid no attention. One by one, they tried to oust Bonny. I remember Chancy plopped her rear end down on top of Bonny's head. For some reason that didn't get her inside the pocket, and Bonny seemed not to notice her. Lila, the smart rat in the mischief, took top honors for her creative solution. She dove straight down alongside Bonny, to the bottom of the pocket, and squished her over, remaining vertical and upside down. This made for an incredible tight fit of two rats in a pocket. Then Lila shoved her nose into Bonny's bottom, as if to nudge her up and out. At that Bonny's eyes popped open and she erupted into protest squeaks, looking bewildered but also like she had no intention of going anywhere soon. Lila never did move Bonny's bum even a little bit, but being smart and stubborn, she buckled down for the long haul and sustained her upside down stance. After awhile, when I realized I was witnessing a stand-off, I squeezed the pocket bottom gently and extracated Lila, who emerged with both disappointment and grim determination on her face.